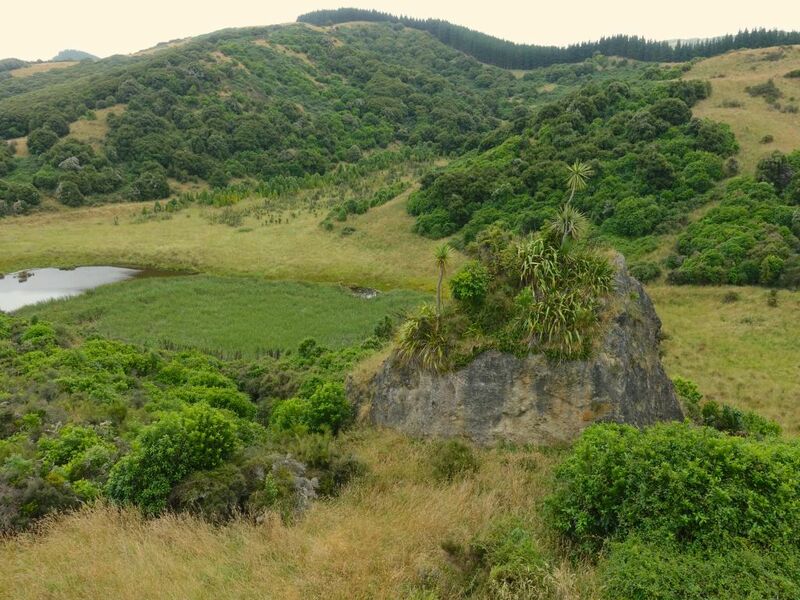 The revegetation of 4 hectares of native grassland and 7 hectares of swamp scrub provided the opportunity to trial the re-establishment of non-vascular plant species, as well as the higher plants which are normally the focus of restoration efforts. Method. 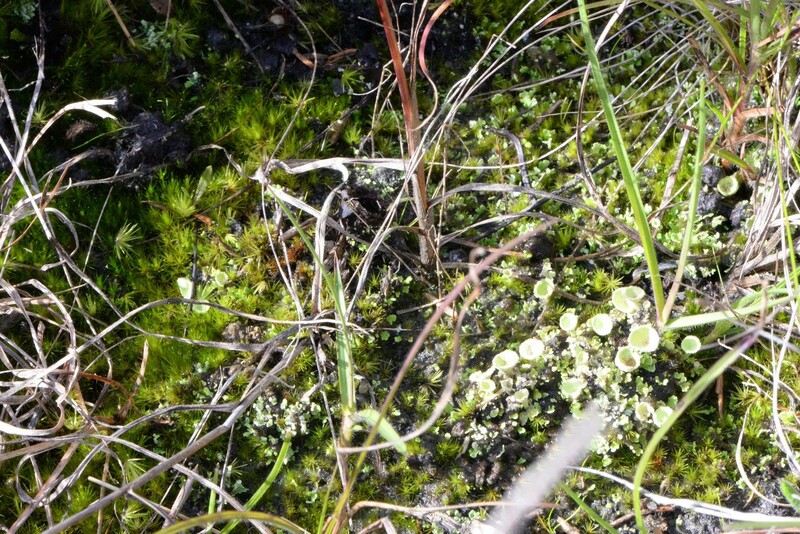 A diversity of cryptogams including Thuidiopsis furfurosa, Hypnum cuppressiforme, Triquetrella papillata and some Rosulabryum and lichen species were collected in the field from nearby remnants of native vegetation threatened with imminent destruction by freeway construction and new housing estates. These were placed in a blender and made into a 2 litre, thick slurry and the slurry was then diluted into a 20 litre a firefighting backpack. 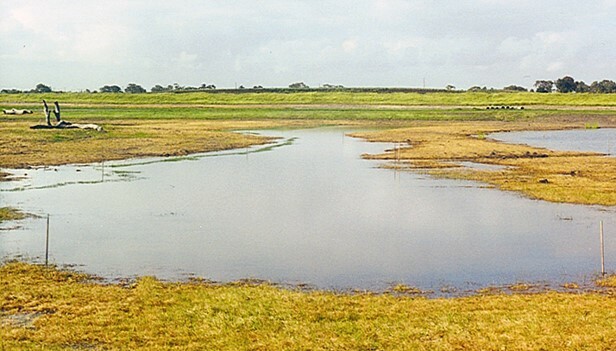 The diluted slurry was then applied to bare soils in the revegetated areas at the Waterways in August 2002; some areas were left untreated as a control. Results. It was not until the wet winter of 2016 that it became apparent how successful this technique had been. There are now quite large areas with a good cover of cryptogams, particularly in the restored grassland and swamp scrub areas. There are some cryptogams in the untreated areas, but the species richness and cover are much lower. Cryptogamic crust cover appears to suppress weed germination, reducing the need for herbicide application, yet provides recruitment opportunities for native forbs (see Photos 1-3). Acknowledgements. Thanks are due to the Haines family who were the developers of “The Waterways”, and in particular Stephen Haines, for involving us in the revegetation of the site and allowing us scope to trial different ecological restoration techniques. 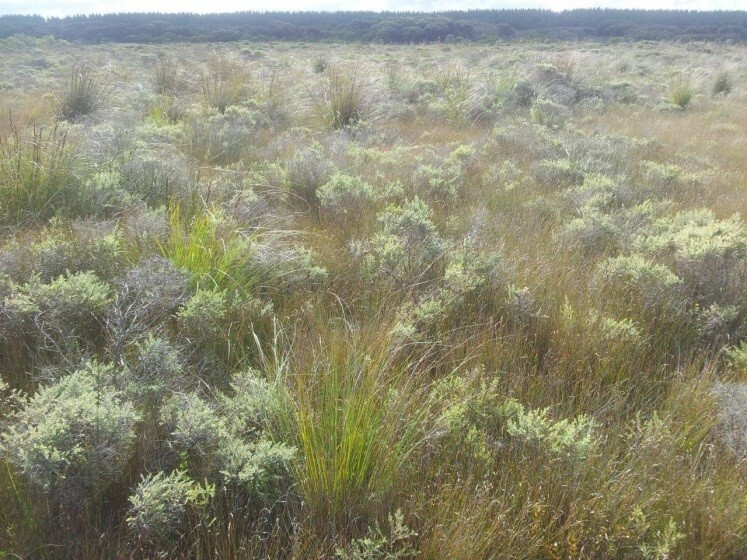 Posted on 11 July 2018 by teinm | Comments Off on Recovery of indigenous plants and animals in revegetated areas at ‘The Waterways’, Victoria. Introduction. 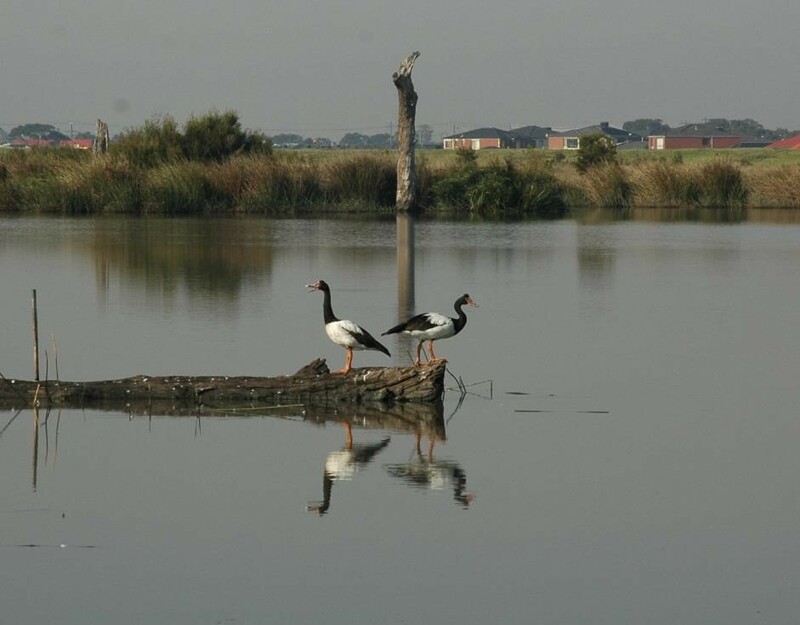 Waterways is a 48-hectare restoration project located on Mordialloc Creek in Melbourne’s south- eastern suburbs which combines a housing estate with large areas of restored habitat set aside for indigenous fauna and flora in open space, lakes and other wetlands (see Photo 1). Prior to restoration the land at Waterways was a property used for grazing horses and supported pasture dominated by exotic species such as Reed Fescue (*Festuca arundinacea) and Toowoomba Canary Grass (*Phalaris aquatica). (Note that an Asterix preceding a scientific name denotes that the species is not indigenous to the local area). 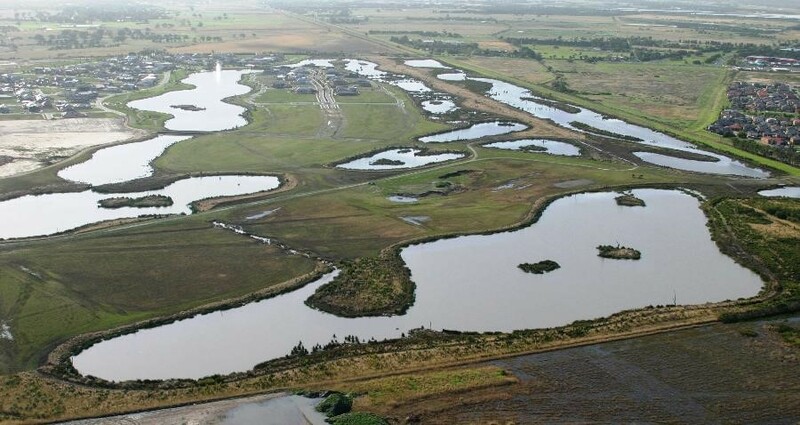 The habitats which are being restored at “The Waterways” reflect those that originally occurred in the Carrum Carrum Swamp, a vast wetland complex which, prior to being extensively drained in the 1870s, stretched from Mordialloc to Kananook and as far inland as Keysborough. Local reference ecosystems were selected to act as a benchmark for what was to be achieved in each restored habitat in terms of species diversity and cover. 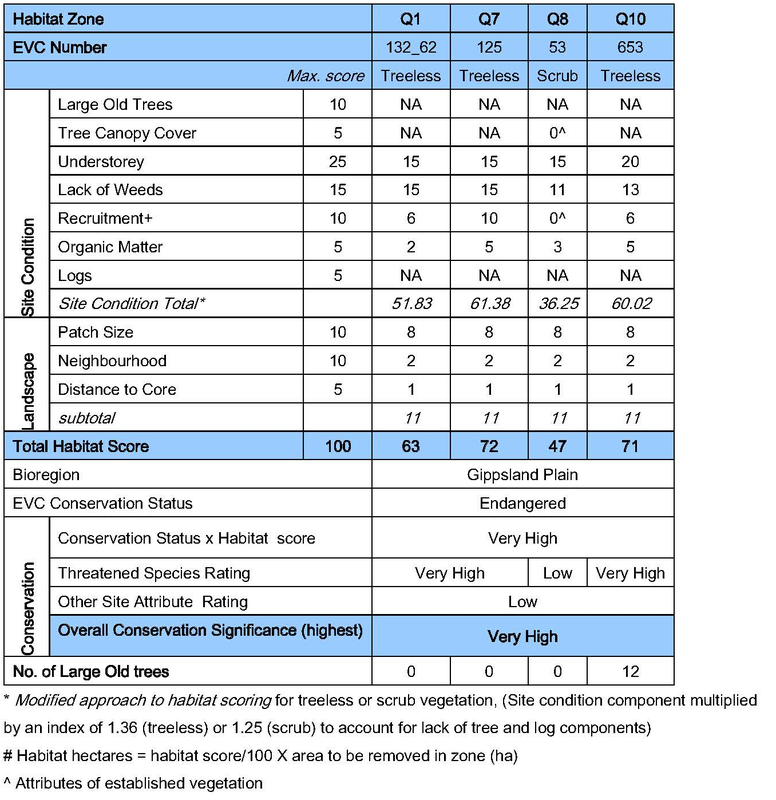 Habitat Hectare assessments have been used to monitor the quality of restored vegetation (see Appendix 1). Photo 2. 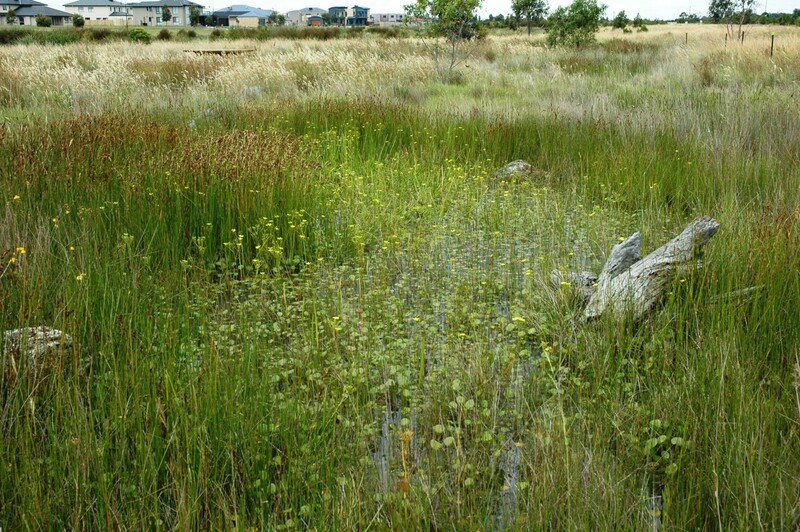 This sequence of photographs, taken over a nine-month period at the Waterways, shows vegetation establishment in a constructed wetland from newly constructed and bare of native species on the left to well vegetated with a high cover of indigenous plants and minimal weeds on the right. Works undertaken. Restoration of the site commenced in October 2000. 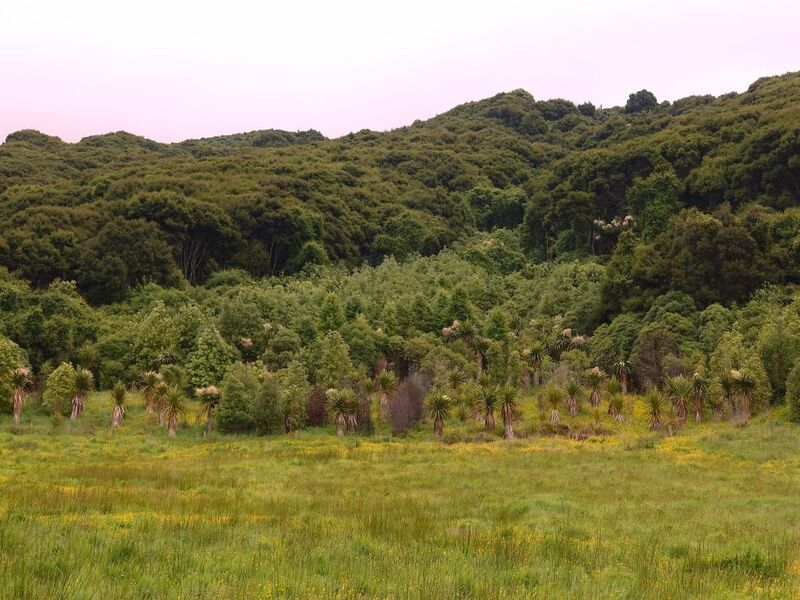 Extensive weed control and earthworks were carried out prior to the commencement of revegetation works, which involved planting, by 2003, over 2 million local provenance, indigenous plants. Grassland species were planted out of hikos at a density of 5 to 6 per square meter into areas that had been treated with both knock-down and pre-emergent herbicide. Ongoing management of the site has included ecological burning and follow up weed control. When started the Waterways was the largest and most complex ecological restoration project ever undertaken in Victoria. Open water, Submerged Aquatic Herbfields and Exposed Mudflats. Deep, open water areas cover an area of about 30 hectares of the site. Vegetation growing in this habitat includes submerged herb-fields of Pondweeds (Potamogeton species), Eel Grass (Vallisneria australis) and Stoneworts (Chara and Nitella species), which were planted over summer 2000/01. Densely vegetated marshes. This habitat occupies about 10 hectares of the site, occurring where water is less than 1.5 meters deep around the fringes of the lakes and as broad bands across the wetlands. Swards of large sedges including Tall Spike-rush (Eleocharis sphacelata), Jointed Twig-sedge (Baumea articulata), Leafy Twig-sedge (Cladium procerum) and River Club-rush (Schoenoplectus tabernaemontani); aquatic herb-fields of Water Ribbons (Cycnogeton procerum), Upright Water-milfoil (Myriophyllum crispatum) and Running Marsh-flower (Ornduffia reniformis); as well as meadows supporting rushes, sedges and amphibious herbs. 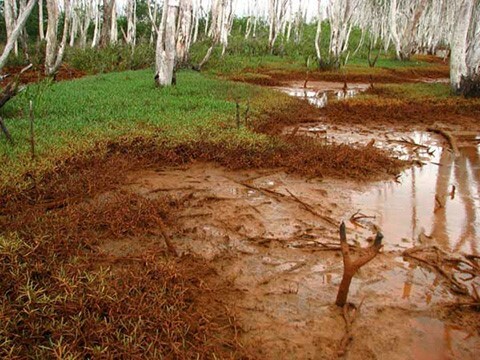 Localized areas with high salinity (4000 to 12 000 ppm) have been planted with a halophytic (salt tolerant) community including Sea Rush (Juncus krausii), Australian Salt-grass (Distichlis distichophylla), and Shiny Swamp-mat (Selliera radicans). Planting began in the marshes at the Waterways in October 2000 and vegetation established very rapidly in most areas (see Photo 2). This vegetation type provides habitat for the locally vulnerable Woolly Water-lily (Philydrum lanuginosum). 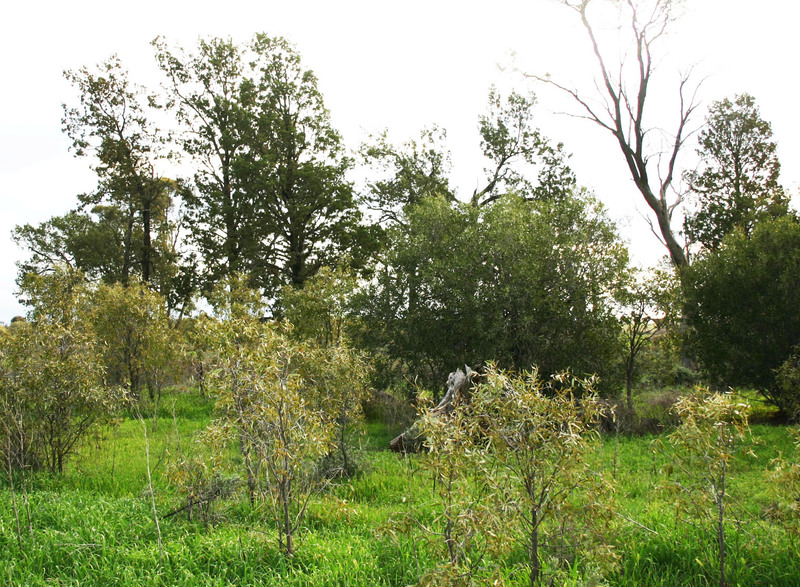 Swamp Paperbark Shrubland covers about 8 hectares, consisting of a 1ha remnant and additional areas that were planted in spring/summer 2001. As this shrubland habitat matures it is forming a dense canopy of species including Swamp Paperbark (Melaleuca ericifolia), Prickly Moses (Acacia verticillata subsp. verticillata), Manuka (Leptospermum scoparium), Woolly Tea-tree (Leptospermum lanigerum), Tree Everlasting (Ozothamnus ferrugineus) and Golden Spray (Viminerea juncea). Photo 3. 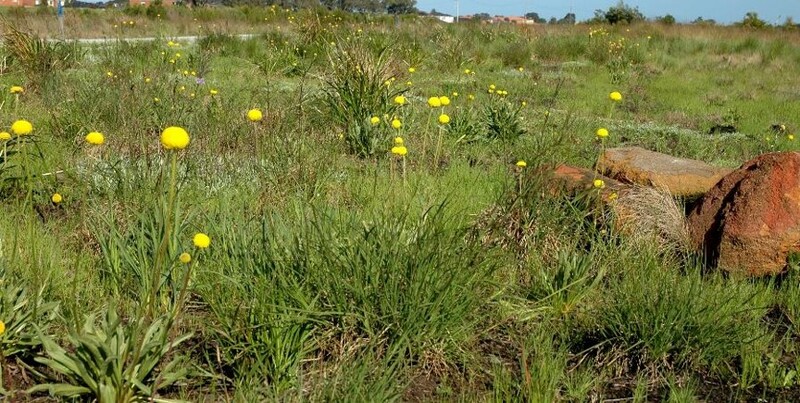 Rare plant species that have been established in restored native grasslands at “Waterways” include Grey Billy-buttons (Craspedia canens), Matted Flax-lily (Dianella amoena) and Pale Swamp Everlasting (Coronidium gunnianum). 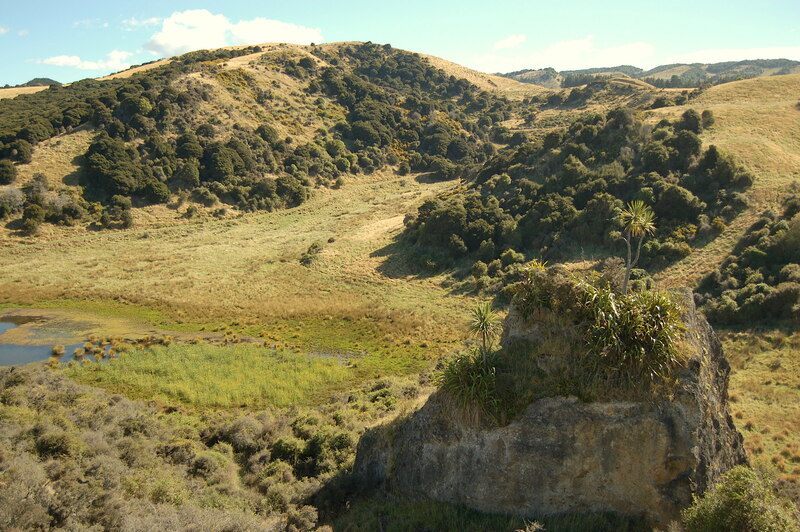 Tussock Grassland covers about four hectares at the Waterways between two major wetland areas. About a third of this habitat was planted in spring 2001, with the remainder in spring 2002. 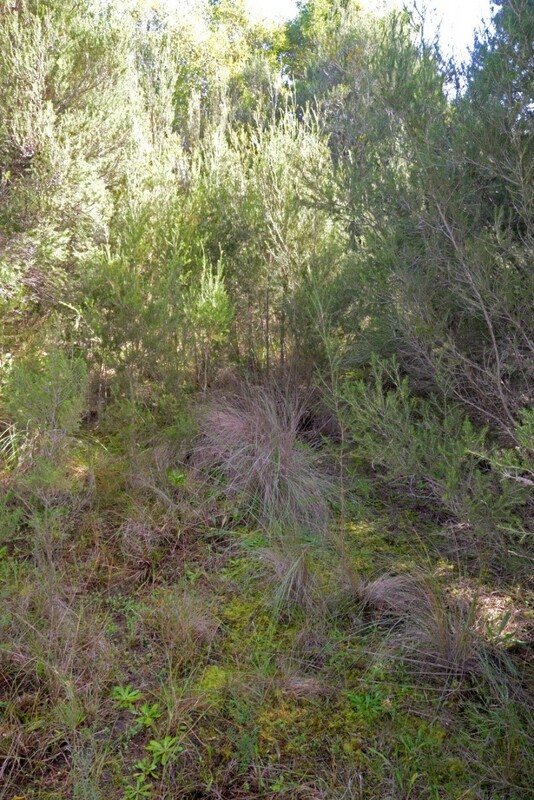 The dominant plants of this habitat are tussock-forming grasses including wallaby grasses (Rytidosperma species), Kangaroo Grass (Themeda triandra) and Common Tussock Grass (Poa labillardierei var. labillardierei). A diverse array of native wildflowers occurs amongst these grasses. Rare plant species that have been established in this habitat zone include Grey Billy-buttons (Craspedia canens), Matted Flax-lily (Dianella amoena) and Pale Swamp Everlasting (Coronidium gunnianum, see Photo 3). Plains Grassy Woodland This habitat type occurs in mosaic with Tussock grassland and differs in that it supportsscattered trees and clumps of shrubs. River Red Gum (Eucalyptus camaldulensis subsp. camaldulensis) and Swamp Gum (Eucalyptus ovata var. ovata) have been planted so that they will eventually form an open woodland structure. Other tree and tall shrub species planted in this habitat include Drooping Sheoak (Allocasuarina verticillata), Blackwood (Acacia melanoxylon) and the tree form of Silver Banksia (Banksia marginata), which is now very uncommon in the local area. Seasonal Wetlands Small seasonal wetlands occur within Tussock Grassland (see Photo 4). Rare plant species that have been established in this habitat zone include Swamp Billy-buttons (Craspedia paludicola), Woolly Water-lily (Philydrum lanuginosum), Grey Spike-rush (Eleocharis macbarronii), Giant River Buttercup (Ranunculus amplus) and the nationally endangered Swamp Everlasting (Xerochrysum palustre). The Waterways is home to 19 rare and threatened fauna species including the nationally endangered Australasian Bittern (Botaurus poiciloptilus), Glossy Grass Skink (Pseudemoia rawlinsoni) and Magpie Goose (Anseranas semipalmata). The successful establishment of diverse vegetation has so far attracted 102 species of native birds, and the wetlands on the site are home to seven species of frogs. Open water areas support large populations of Black Swans (Cygnus atratus), Ducks (Anas species), Eurasian Coots (Fulica atra), Cormorants (Phalacrocorax and Microcarbo species), Australian Pelicans (Pelecanus conspicillatus) and Australasian Darters (Anhinga novaehollandiae) that either feed on fish and invertebrates or the foliage and fruits of water plants. As water levels recede over summer areas of mudflat are exposed. These flats provide ideal resting areas for water birds as well as feeding habitat for migratory wading birds including the Sharp-tailed Sandpiper (Calidris acuminata), Red-necked Stint (Calidris ruficollis) and Common Greenshank (Tringa nebularia) that fly from their breeding grounds as far away as Alaska and Siberia to spend the summer in Australia and are protected under special treaties between the Governments of countries through which they travel. In 2007 a small group of Magpie Geese (Anseranas semipalmata) became regular visitors to The Waterways (see Photo 5). 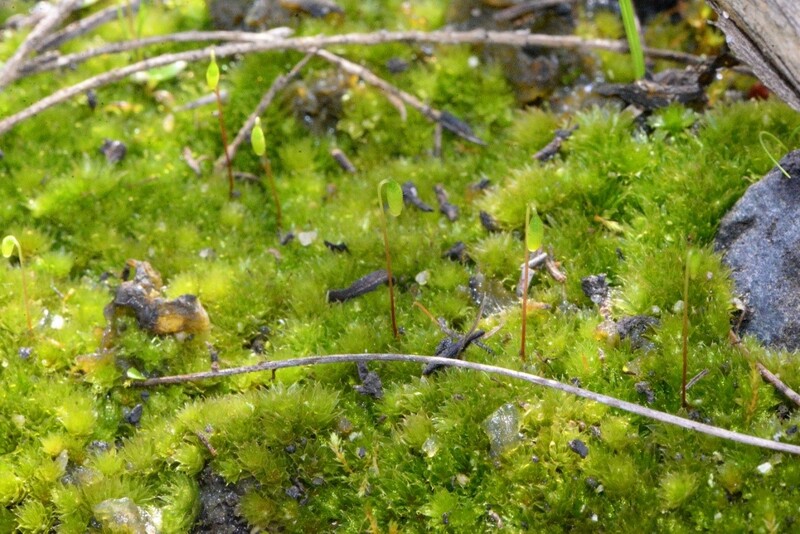 This species was once extremely abundant in the Carrum Carrum Swamp. However, it was driven to extinction in southern Australia in the early 1900s by hunting and habitat destruction. The Magpie Goose seems to be making a recovery in Victoria, with numbers building up from birds captured in the Northern Territory and released in South Australia that are spreading across to areas where the species formerly occurred. Seasonal wetlands are important breeding areas for frogs including the Banjo Frog (Limnodynastes dumerilii), Striped Marsh Frog (Limnodynastes peroni) and Spotted Grass Frog (Limnodynastes tasmaniensis) and a range of invertebrates that do not occur in the larger, more permanent storm water treatment wetlands such as Shield Shrimp (Lepidurus apus viridus). Birds which utilize these wetlands for feeding include the White-faced Heron (Egretta novaehollandiae) and Latham’s Snipe (Gallinago hardwickii). Restored grassland provides an ideal hunting ground for several birds of prey, including the Brown Falcon (Falco berigora), Black-shouldered Kite (Elanus axillaris) and Australian Kestrel (Falco cenchroides). It also provides cover and feeding habitat for insect and seed-eating birds such as the Brown Quail (Coturnix ypsilophora). A flock of about 20 Blue-winged Parrots (Neophema chrysostoma) have been regularly seen in this habitat. These parrots are usually quite uncommon in the Melbourne area. 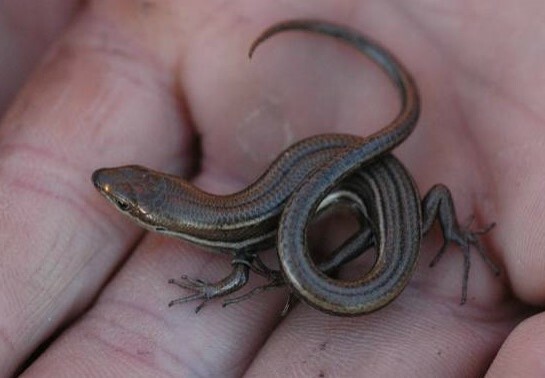 Moist grasslands beside the wetland have been colonised by the vulnerable Glossy Grass Skink (Pseudemoia rawlinsoni) (see Photo 6). 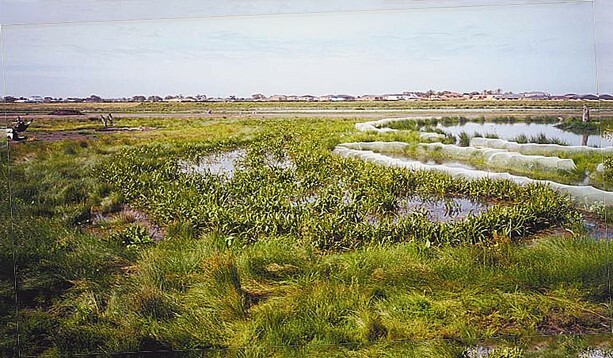 Densely vegetated marshes provide habitat for a diversity of small, secretive birds such as Ballion’s Crake (Porzana pusilla), Little Grassbird (Megalurus gramineus) and Australian Reed Warbler (Acrocephalus australis), which find suitable refuges in the cover provided by dense vegetation. Dense thickets of Swamp Paperbark shrublands provide cover and feeding habitat for Ring-tail Possums (Pseudocheris peregrinus) and bushland birds such the Eastern Yellow Robin (Eopsaltria australis), thornbills (Acanthiza species), Superb Fairy-wren (Malurus cyaneus) and Grey Fantail (Rhipidura albiscapa). As the grassy woodlands mature they are providing structural habitat diversity and accommodating woodland birds such as cuckoos (Cacomantis and Chalcites species) and pardalotes (Pardalotus species). It will take many years for the River Red Gums to reach a majestic size and stature, and to provide tree hollows which are essential for many species of native fauna. A limited number of tree hollows are provided in the dead trees (stags) that were placed in the Waterways wetlands. The Future. The habitats that have been created at the Waterways are about 18 years old, yet they have already attracted a vast array of native fauna. Waterways is now home to 14 rare and threatened plant species and 19 threatened animal species. There is incredible potential for the area to provide vitally important habitat for an even greater diversity of rare plants and animals as these habitats mature. If the area is to reach its full potential careful management of weeds and pest animals is required. Ongoing monitoring of flora and fauna is also necessary. These are both areas in which the local community is becoming involved. Acknowledgements. The high standard of restoration achieved on the Waterways project was due to the project being appropriately funded and because it was managed by ecologists experienced in planning and implementing ecological restoration. The project was partly funded by Melbourne Water, who are now the managers of the site, and partly by a developer, the Haines Family. This unique relationship and the generosity and willingness to try something innovative by the developer were important factors in the success of the project. Comments Off on Recovery of indigenous plants and animals in revegetated areas at ‘The Waterways’, Victoria. Introduction. 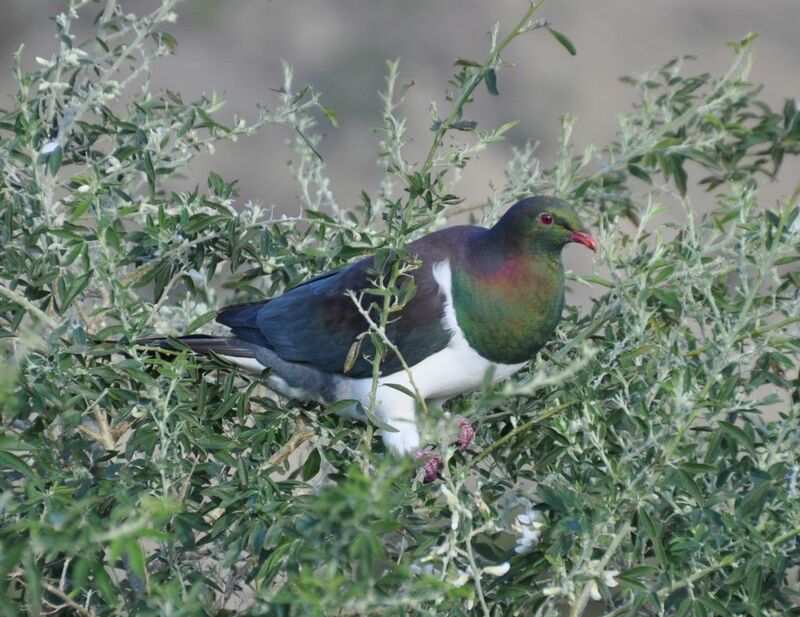 Although perches have been shown to enhance seed dispersal into revegetation sites, the efficacy of providing a water source to attract seed dispersers is largely untested. 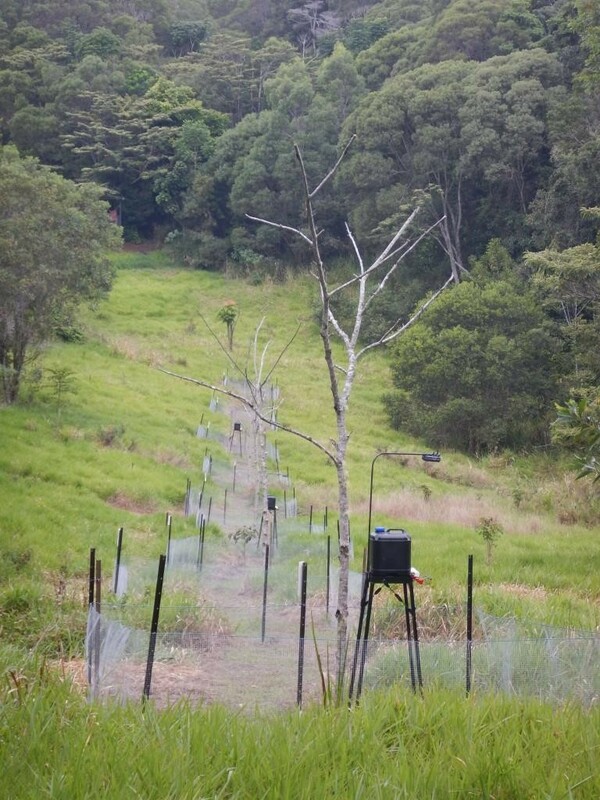 In a Griffith University-led study aimed at “kick-starting” conversion of pasture to forest www.wettropics.gov.au/cfoc , bird-attracting structures that included a perch and water trough at the base were shown to enhance frugivore-assisted seed dispersal. A complementary study in the same sites has identified the seeds of over 40 bird dispersed species deposited in the water troughs (Amanda Freeman; The School for Field Studies, Centre for Rainforest Studies (SFS-CRS) and Griffith University; 2012-2014, unpublished data). Although the water troughs demonstrably attracted frugivorous birds, most notably Pied Currawongs (Strepera graculina ) using the water to regurgitate, any seeds regurgitated into troughs would be unavailable to germinate (Fig 1.). Preliminary trial. Using a commercially available automatic waterer used for poultry, we designed a water point with a water dispenser that is too small for birds to regurgitate or defecate into, allowing expelled seed to fall to the ground. The device is also simple and relatively cheap to build (<$100 Australian). Once installed, the device requires little attention because the water remains cool and evaporation is minimal so the water may last several months without replenishing. The waterer, a plastic container which distributes water to a small dish by the action of a float, sits on a sturdy metal base 1.5m high. The base has a perch allowing birds of different sizes to access the water from several angles and an attachment for a camera to enable bird visits to be monitored. We envisage that the water point may facilitate seed dispersal by attracting frugivorous birds that will regurgitate and/or defecate at or near the water point. 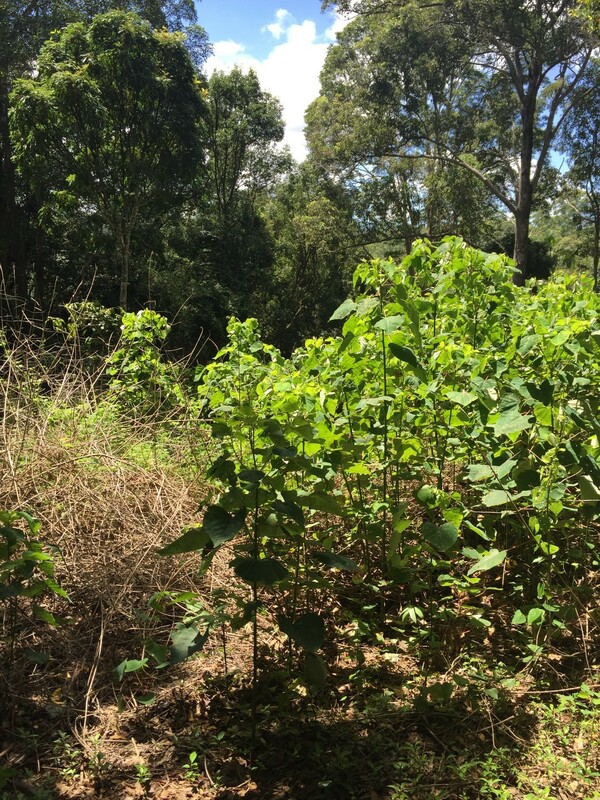 We conducted an initial trial at a revegetation site at SFS-CRS in February 2016. For this trial we baited the water point with Kiwi Fruit (Actinidia sp.) but this was soon consumed by insects. 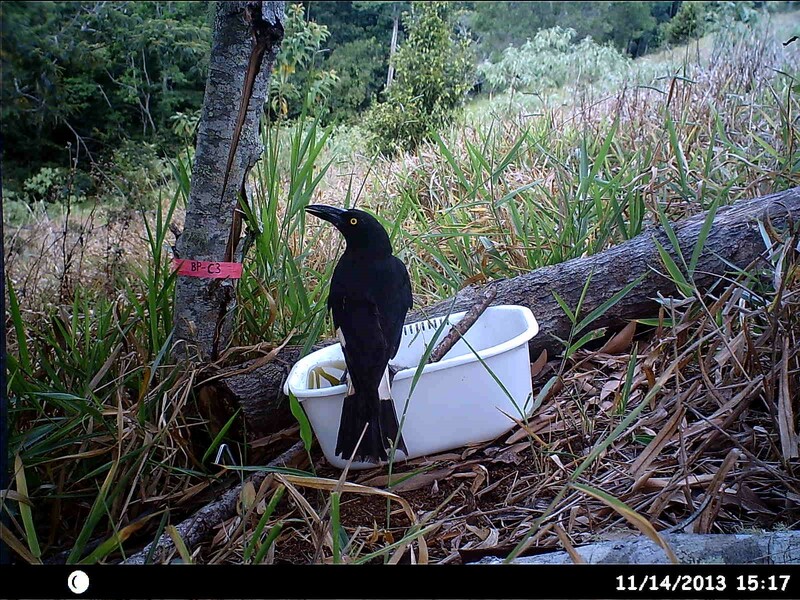 During the trial we recorded two species of fruit-dispersing bird, Pied Currawong and Lewin’s Honeyeater (Meliphaga lewinii) using our prototype water point within one month of its installation in (Fig 2.). Figure 2. 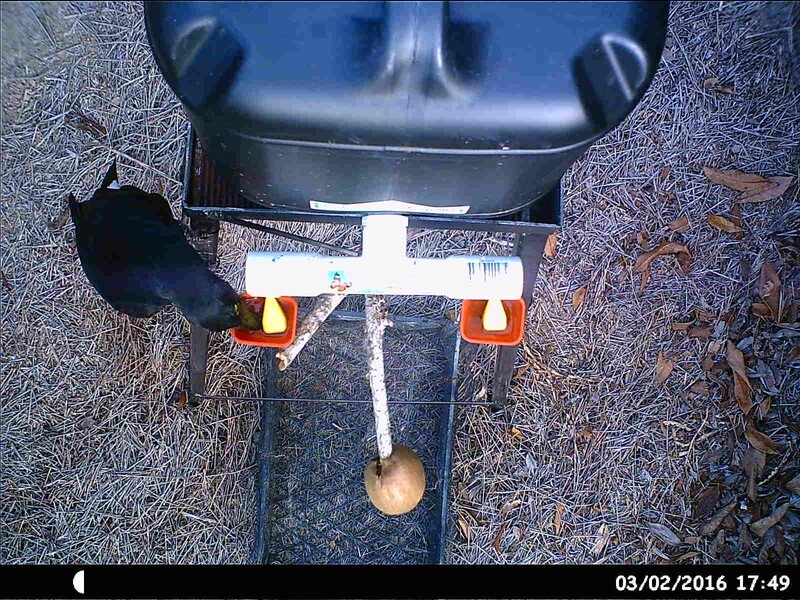 A Pied Currawong drinking from a water point (kiwi fruit bait in foreground). Design of second trial. In July 2016 we established a small trial at SFS-CRS to test the relative efficacy of perches alone versus perches coupled with our water point device in facilitating seed dispersal into cleared sites that lack remnant or planted trees. We have nine fenced 3m2 plots in ungrazed former pasture, 15m from the edge of primary rainforest (Fig 3.). Six plots have a perch, 3-4m high, cut to standard form from Sarsaparilla (Alphitonia petriei) trees. Three of these plots also have a water point placed close to the base of the perch and a camera monitoring visits to the water. Three plots have no structures. Grass in all plots will be suppressed by herbicide spray (on an ‘as needed’ basis) and seedling recruitment in the plots will be monitored. In the first three months, no birds have been recorded using the water points in the trial plots. Figure 3. Perch and water device trial plots, September 2016. Key words. Ecological restoration, pest fauna control, captive breeding, foxes, cats. Figure 1. The Peron Peninsula divides the two major bays of the Shark Bay World Heritage Area, Western Australia. Introduction. In 1801, 23 species of native mammals were present in what is now Francois Peron National Park. By 1990 fewer than half that number remained (Fig 1.). Predation by introduced foxes and cats, habitat destruction by stock and rabbits had driven many native animals to local extinction. Project Eden was a bold conservation project launched by the WA government’s Department of Conservation and Land Management (CALM -now Dept of Parks and Wildlife) that aimed to reverse extinction and ecological destruction in the Shark Bay World Heritage Area. The site and program. Works commenced in Peron Peninsula – an approx. 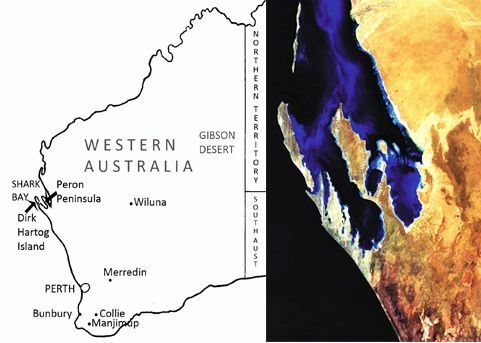 80 km long and 20 km wide peninsula on the semi-arid mid-west coast of Western Australia (25° 50′S 113°33′E) (Fig 1). 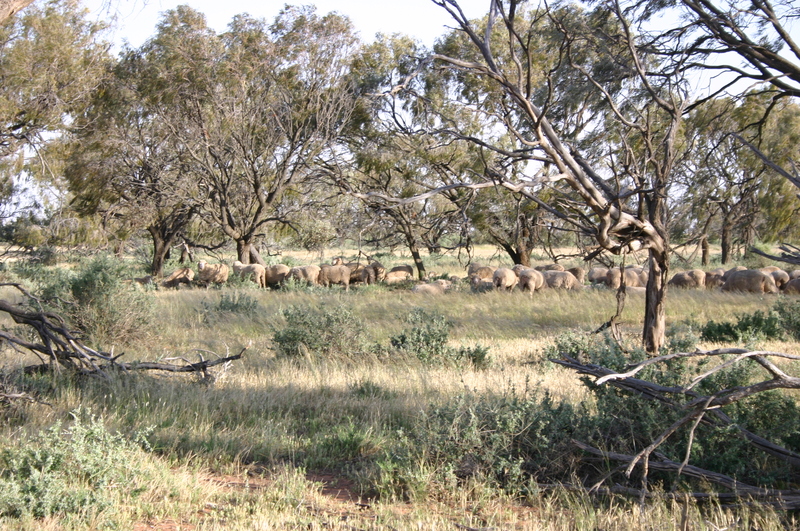 In the early 1990s, removal of pest animals commenced with the removal of sheep, cattle and goats and continued with the control of feral predators. 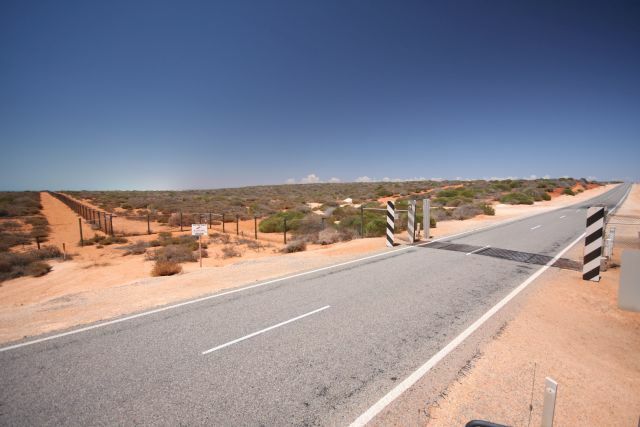 A fence was erected across the 3km ‘bottleneck’ at the bottom of the peninsula where it joins the rest of Australia (Fig 2) to create an area where pest predators were reduced to very low numbers. Figure 2. 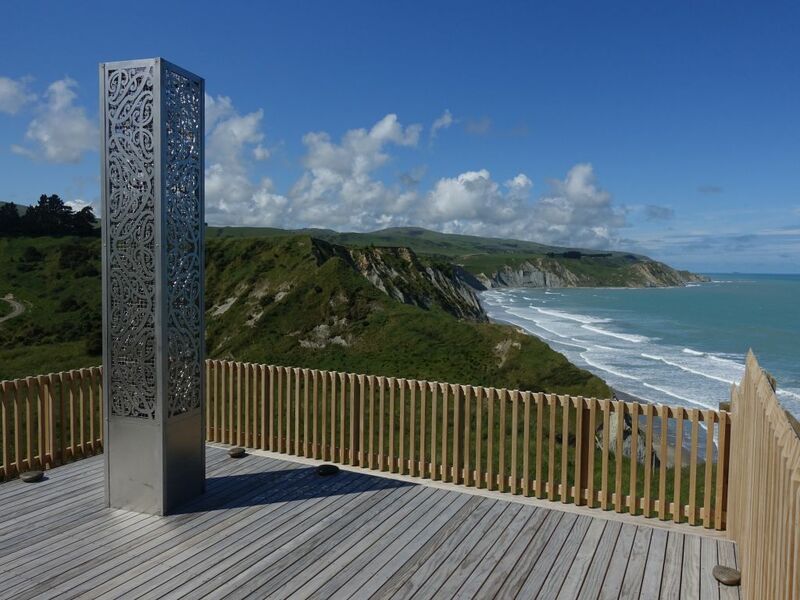 The feral proof fence was erected at the narrow point where Peron Peninsula joins the mainland. Methods. Cat baiting involved Eradicat® cat baits, which were applied annually during March–April at a density of 10 to 50 baits/km2. Cat baiting continued for over 10 years, supplemented with a trapping program, carried out year round over a 8 -year period. Cat trapping involved rolling 10 day sessions of leghold trapping along all track systems within the area, using Victor Softcatch No. 3 traps and a variety of lures (predominantly olfactory and auditory).Tens of thousands of trap nights resulted in the trapping of up to 3456 animals. Fox baiting involved dispersal of dried meat baits containing 1080 poison by hand or dropped from aircraft across the whole peninsula. Baiting of the peninsula continues to occur annually, and removes any new foxes that may migrate into the protected area and is likely to regularly impact young inexperienced cats in the population, with occasional significant reductions in the mature cat population when environmental conditions are favourable. Monitoring for native mammals involved radio-tracking of Bilbies, Woylies, Banded Hare Wallabies, Rufous Hare-Wallabies, Southern Brown Bandicoots, Chuditch and Malleefowl at release, cage trapping with medium Sheffield cage traps and medium Eliots, as well as pitfall trapping of small mammals. The survey method for cats utilized a passive track count survey technique along an 80 km transect through the long axis of the peninsula. The gut contents of all trapped cats were examined. Figure 3. Once foxes were controlled and cats reduced to about 1 cat per 100 km of monitored track, sequential reintroductions of five locally extinct native animals were undertaken. 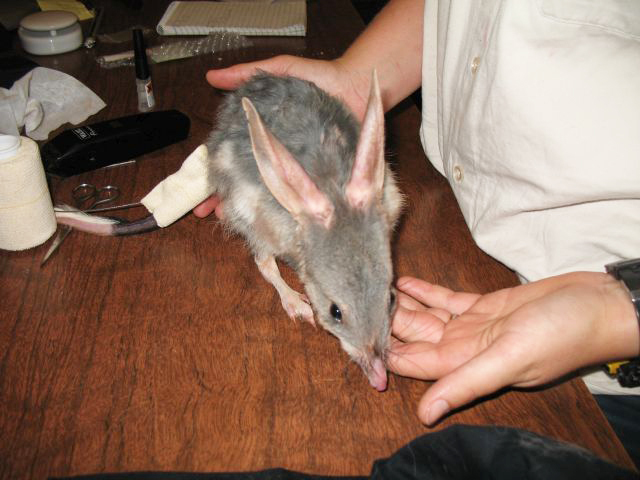 Woylies were first introduced in 1997 from animals caught in the wild at sites in southwest Western Australia. Results. Monitoring has shown that two of the reintroduced species – the Malleefowl and Bilby – have now been successfully established. These species are still quite rare but they have been breeding on the peninsula for several years The Woylie population may still be present in very low numbers, but despite initial success and recruitment for six or seven years, has gradually declined due to prolonged drought and low level predation on a small population. Although the released Rufous Hare-wallabies and the Banded Hare-wallabies survived for 10 months and were surviving and breeding well, they disappeared because of a high susceptibility to cat predation and other natural predators like wedge-tailed eagles. 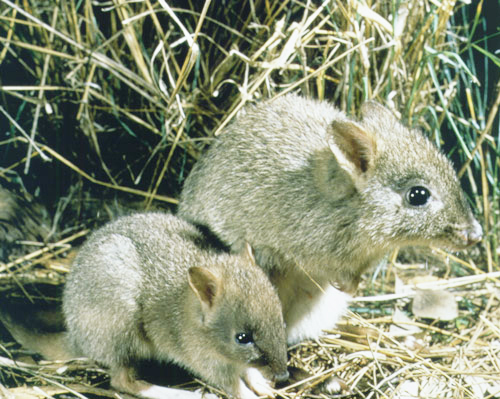 Although some predation of Southern Brown Bandicoot has occurred and the reintroduction is still in the early stages, this species has been breeding and persisting and it is hoped that they will establish themselves in the thicker scrub of the peninsula. Lessons learned. We found that the susceptibility to predation by cats and foxes varies considerably between species. Malleefowl are very susceptible to fox predation because the foxes will find their mound nests, dig up their eggs up and eat them – consequently wiping them out over a period of time. As cats can’t dig, Malleefowl can actually exist with a fairly high level of cats. Bilbies live in their burrows and are very alert so they can persist despite a certain level of cats. But the Rufous Hare-wallaby and the Banded Hare-wallaby are very susceptible to cat predation and fox predation due to their size and habits. Examination of the period of time when species disappeared from the Australian mainland showed that there was a sequence of extirpations, reflecting the degree to which the species were vulnerable to pest predators. The ones that survived longest are those that are less vulnerable. This suggests that if complete control of predators is not possible (considering cat control is extremely difficult), it is preferable to focus on those animals that are least vulnerable. While it could be argued that reintroductions should be delayed until such time as all the cats and foxes have been removed, such a delay (which might take us 10, 20 or even 100 years) is likely to exceed the period of time many of these species will survive without some sort of assistance. It is likely to be preferable to proceed with reintroductions although we might be losing some animals. Future directions. As with the majority of mainland reintroduction projects, level of predator control is the key to successful establishment of reintroduced fauna. The Project is currently under a maintenance strategy and future releases, which included the Western Barred Bandicoot (Perameles bougainville), Shark Bay Mouse (Pseudomys fieldi), geoffroi), Greater Stick-nest Rat (Leporillus conditor) and Red-tailed Phascogale (Phascogale calura) are on hold until improved cat control techniques are available. Despite the uncertain future for reintroductions of these smaller species, ongoing feral animal control activities and previous reintroductions have resulted in improved conditions and recovery for remnant small native vertebrates (including thick billed grass wrens, woma pythons and native mice), and new populations of several of the area’s threatened species which are once again flourishing in their original habitats. Acknowledgements: the program was carried out by Western Australia’s Department of Parks and Wildlife and we thank the many Departmental employees, including District and Regional officers for their assistance over the years, and the many, many other people that have volunteered their time and been a part of the Project over the years, for which we are very grateful. Per E. S. Christensen, Bruce G. Ward and Colleen Sims (2013) Predicting bait uptake by feral cats, Felis catus, in semi-arid environments. Ecological Management & Restoration 14:1, 47-53. Per Christensen and Tein McDonald (2013) Reintroductions and controlling feral predators: Interview with Per Christensen. Ecological Management & Restoration, 14:2 93–100. Piccaninnie Ponds Conservation Park is situated 30 km south east of Mt Gambier in South Australia. For 15-20 years after the park was proclaimed in 1969, there was considerable local interest in trying to address previous changes that had been made to the hydrology of the wetland system. Although it was protected, reserved and supporting a diverse suite of habitats and range of resident threatened species, Piccaninnnie Ponds was far from intact from a hydrological perspective. Prior to European settlement, water that discharged from the karst, rising-spring wetlands in the system flowed eastward across the State border into the Glenelg River Estuary, in far South West Victoria. This is how the system remained until 1906, when the first of several attempts to drain the wetlands of Piccaninnie Ponds directly to the sea occurred. What ensued was a turbulent 9 year period during which the fishermen successfully lobbied to have the creek re-directed to the Glenelg River in 1915; a step which was ultimately unpopular with affected landholders and resulted in an alternative flow path again being cut to the sea two years later in 1917. 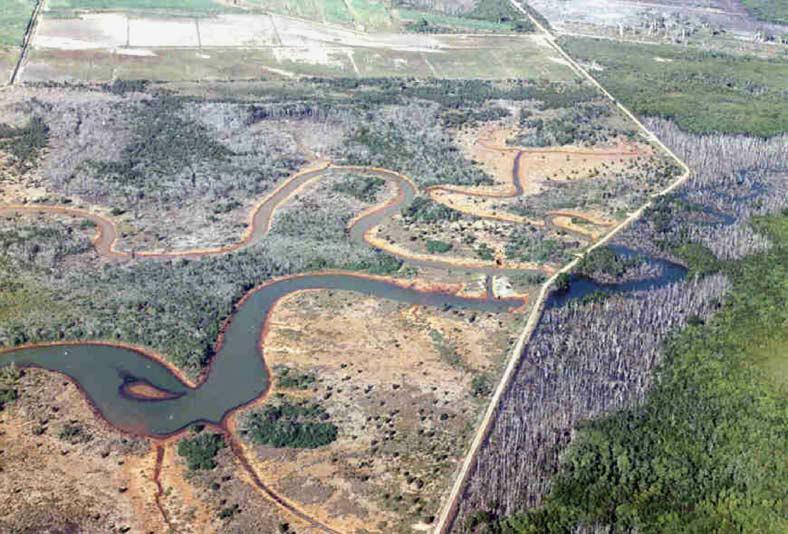 Subsequent ad hoc drainage and development of portions of the wetland system continued and by the time the Piccaninnie Ponds Conservatioon Park was proclaimed in 1969, a new main artificial outlet drained the ponds directly to the sea. The first attempts at advocacy to restore environmental flows to the Glenelg River in the 1970s and 80s to counter this long-term drying trend in the Park were unsuccessful, until the concept was revisited and a series of steps undertaken, starting in 2001, to achieve hydrological restoration. These steps culminated in the following actions. Fig. 1, Stage 1 weir and fishway under construction in 2006. 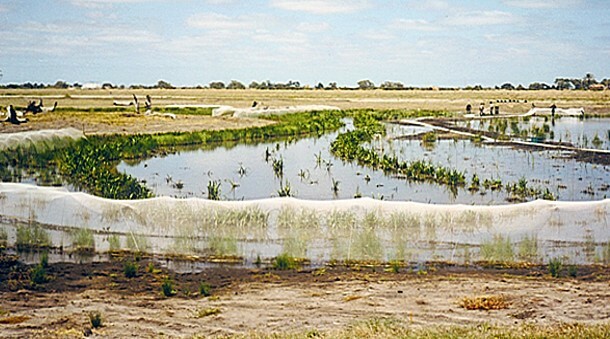 2006 – Stage 1 weir and fishway constructed at Piccaninnie Ponds (Figure 1) regulated outflows on the artificial outlet. This had the effect of increasing inundation in a small area immediately upstream of the structure, under the direct influence of the weir pool created by the new structure, as shown in Fig 2. 2013 – The stage 2 weir and fishway upgrade (Fig 3) resulted in the structure height being lifted to increase future management flexibility, including providing the future ability to completely block outflows, should the option of re-instating the original flow path one day become a reality. 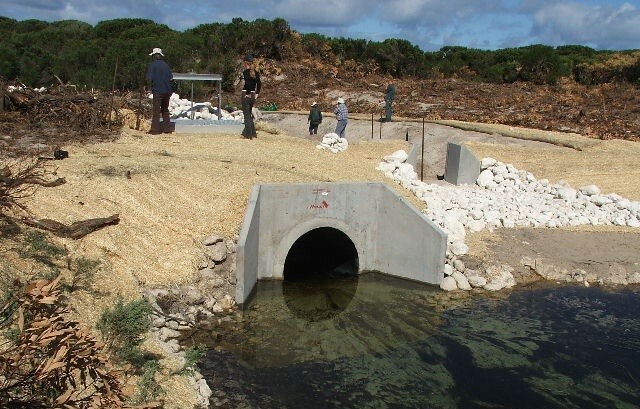 The stage 2 upgrade was completed at the same time as providing a new flow path to physically reconnect the isolated eastern and western basins at Piccaninnie Ponds. 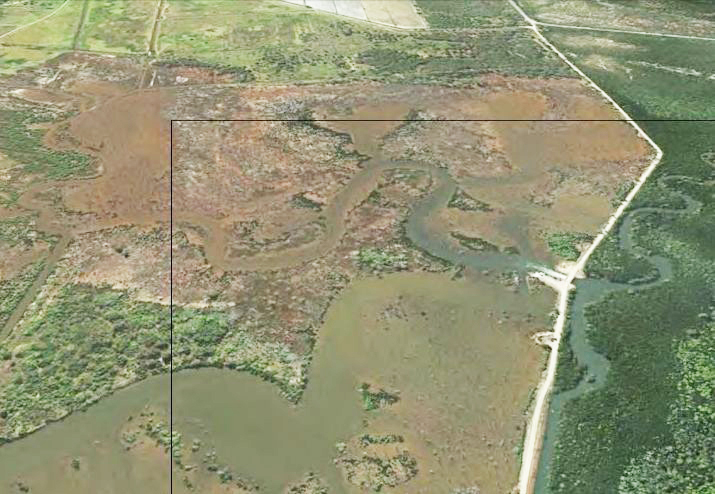 These wetlands had been separated for several decades by a combination of lower water levels, sand drift and the impact of the Piccaninnie Ponds Road. An aerial photographic view of the new flow path is shown in Fig 4. 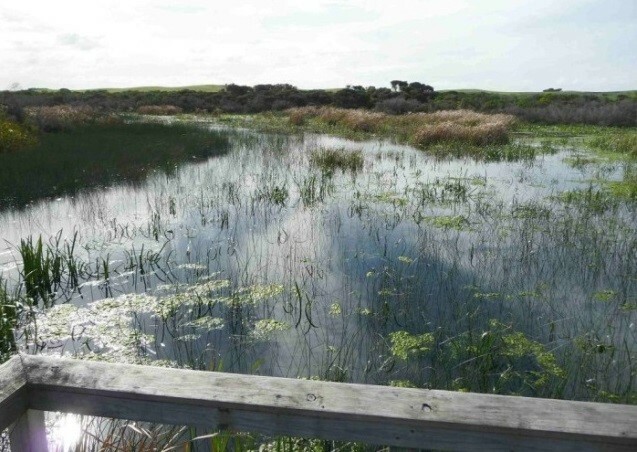 These works within the original Conservation Park, have occurred in in a complementary way with those that have occurred in the neighbouring, newly reserved area at Pick Swamp, each contributing to the wider vision for restoration of this wetland complex. Fig. 2a. Drained condition of habitat upstream of the Stage 1 weir (prior to construction in 2006). Fig. 2b. The upstream inundation and habitat change caused by the stage 1 weir, 2012. Fig. 3. The lifted and redesigned stage 2 weir and fishway on the main artificial outlet at Piccaninnie Ponds – upon completion in 2013. Fig, 4b. After construction/restoration – in January 2014. Acknowledgements. The outcomes of the restoration project described can be attributed to a wide range of people who, in addition to the author (see current contact details below), worked at the South Australian Department of Environment, Water and Natural Resources during the period described. DEWNR project ecologists overseeing the works described here include Ben Taylor (stage 1 weir) and Steve Clarke (stage 2 weir and associated works). The project was generously funded and supported by a range of different grants and programs administered by the South Australian Government, Australian Government and the South East Natural Resources Management Board. Long Swamp is a 15 km long coastal freshwater wetland complex situated in Discovery Bay Coastal Park, approximately 50 km north-west from Portland in south-western Victoria. The wetland system supports a diverse suite of nationally threatened species and is currently undergoing a Ramsar nomination process. 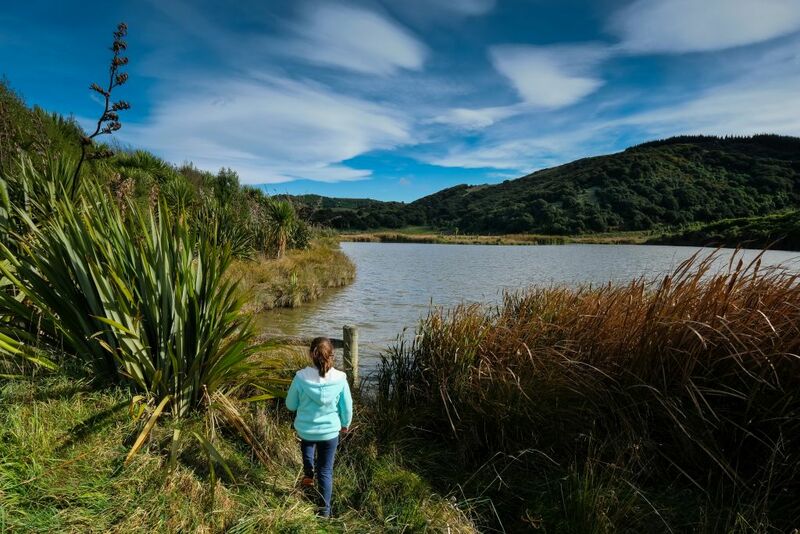 Despite its size, reserved status and impressive biodiversity values, including recognition on the Directory of Important Wetlands in Australia, the local community in Nelson had expressed concern for over a decade about the impact that two artificial outlets to the ocean were having on wetland condition. The outlets were cut during an era when the swamp was grazed, many decades before being dedicated as a conservation reserve in the 1970s. The wetland originally discharged into the ocean via Oxbow Lake and the Glenelg River mouth at Nelson. These changes to hydrology caused an interruption of flows, contributing to a long-term drying trend within the wetland complex. This was not immediately obvious to many as the gradual drying of wetlands in a natural area is often less noticeable than in a cleared agricultural area, driven by a seamless and gradual shift towards more terrestrial species within the composition of native vegetation (Fig. 1). Figure 1. Shrub (Leptospermum lanigerum) encroachment into sedgeland underway in Long Swamp. In 2012, Nature Glenelg Trust (NGT) became actively involved in Long Swamp, working closely with Parks Victoria, the Nelson Coast Care Group, and the Glenelg Hopkins CMA. 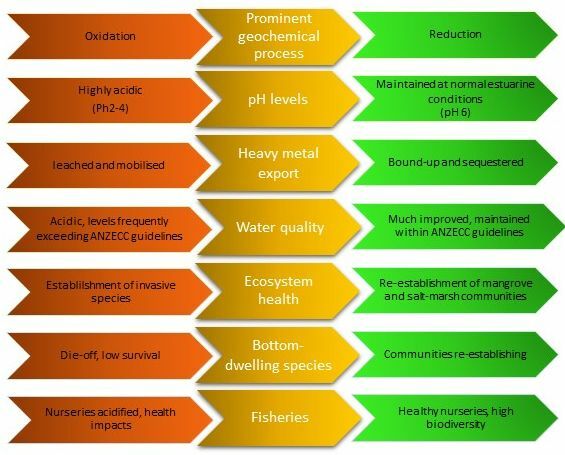 The initial involvement was to undertake a scientific review of the aquatic ecological values that might be impacted by the ecological shifts anecdotally observed to be underway. This early work identified that the more remote artificial outlet to the sea (White Sands) had in fact naturally closed, with a dune forming in front of the former channel several years earlier during the Millennium Drought (c. 2005). This formed an area of aquatic habitat immediately upstream of the former outlet that is now home to a diverse native freshwater fish community, including two nationally threatened fish species, the Yarra Pygmy Perch (Nannoperca obscura) and Dwarf Galaxias (Galaxiella pusilla). This observation and other investigations led to the planning of a restoration trial aimed at regulating or possibly blocking the second and final artificial outlet at Nobles Rocks to increase the availability, diversity and connectivity of aquatic habitats throughout Long Swamp, in order to benefit a wide range of wetland dependant species. As well as undertaking basic monitoring across a broad range of taxonomic groups (birds, vegetation, frogs), the project has a particular emphasis on native freshwater fish populations as a primary indicator of project success. Figure 2 . Aerial view of Nobles Rocks artificial outlet, detailing the location of the three trial sandbag structures. Figure 3. Nature Glenelg Trust staff members celebrate the completion of the third and final sandbag structure with some of the many dedicated volunteers from the local community. Reversal of artificial outlet impact over three phases. 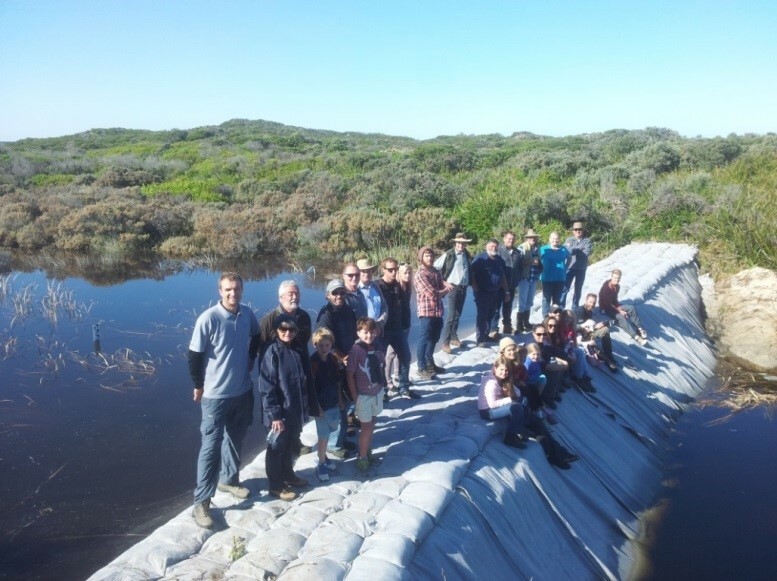 The first two stages of the restoration trial in May and July 2014 involved 56 volunteers from the community working together to construct low-level temporary sandbag structures, initially at the most accessible and technically feasible sections of drain under flowing conditions. 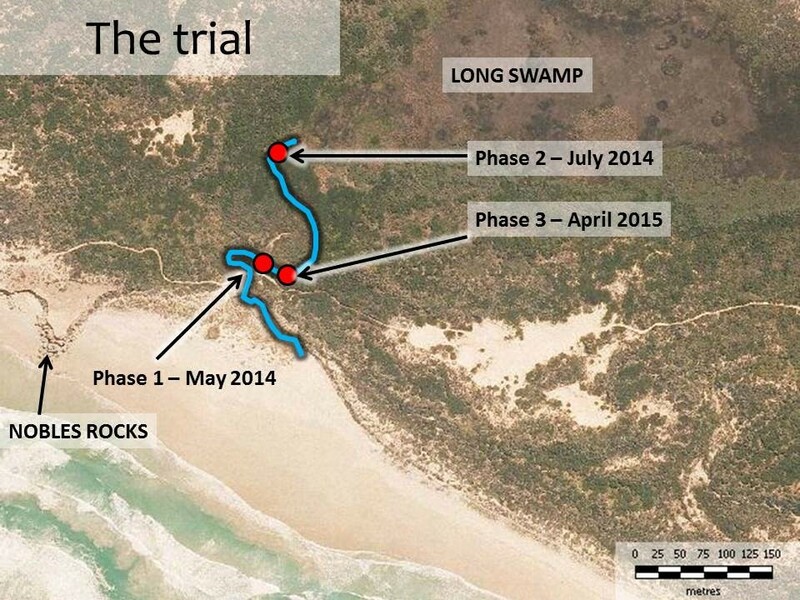 Tackling the project in stages enabled us to learn sufficient information about the hydrological conditions at the site in 2014, before commencing the third and final stage of the trial in March 2015. On the 27th April 2015, the main structure was completed, following two days of preparation and nine days of sandbagging (using about 6,600 sandbags), which were put in place with the dedicated help of over 30 volunteers (see Figs 3 and 4). To achieve our target operating height, the structure was raised by a further 30 cm in August 2015. A series of gauge boards with water depth data loggers were also placed at key locations in the outlet channel and upstream into Long Swamp proper, to monitor the change in water levels throughout each stage of restoration and into the future. Figure 4a. View of the Phase 3 Restoration Trial Structure location prior to construction in March 2015. Figure 4b. Same location in June 2015, after construction of the Restoration Trial Structure. Water levels in the swamp immediately upstream of the final structure increased, in the deepest portion of Long Swamp, from 34 cm (in April 2015) to 116 cm (in early September 2015). Further upstream, in a shallower area more representative of the impact on Long Swamp in the adjacent wider area, levels increased from being dry in April 2015, 14 cm deep in May, through to 43 cm deep in early September 2015, as shown in Figure 5. This is a zone where the shrub invasion is typical of the drying trend being observed in Long Swamp, and hence will be an important long-term monitoring location. To evaluate the response of habitat to short and longer-term hydrological change, we also undertook longer-term landscape change analysis through GIS-based interpretation of aerial photography. This showed that we have currently recovered approximately 60 hectares of total surface water at Nobles Rocks, not including larger gains across downstream habitats as a result of groundwater mounding, sub-surface seepage and redirected surface flows that have also been observed. These initial results and longer-term outcomes for targets species of native plants and animals will be detailed fully in future reports. Figure 5a. Further inland in the swamp after the Phase 3 structure was complete, shown here in May 2015. Depth – 14 cm. Figure 5b. Same photopoint 4 months later in September 2015. Depth – 43 cm. Lessons learned and future directions.Meaningful community participation has been one of the most critical ingredients in the success of this project so far, leading to a strong sense of shared achievement for all involved. Monitoring will continue to guide the next steps of the project, with the ultimate aim of informing a consensus view (among those with shared interest in the park) for eventually converting the trial structure to a permanent solution. Acknowledgements. Project partners include Parks Victoria, Nelson Coast Care Group, the Glenelg Hopkins CMA and the Friends of the Great South West Walk. Volunteers from several other groups have also assisted with the trials. Grant funding was generously provided by the Victorian Government. Key words: Lowland subtropical rainforest, ecosystem reconstruction, drinking water catchment, continual improvement process. Introduction. Rous Water is actively engaged in ecosystem reconstruction within the drinking water catchment areas it manages on behalf of the community. The aim of these activities is to improve the functioning of essential natural processes that sustain water quality. 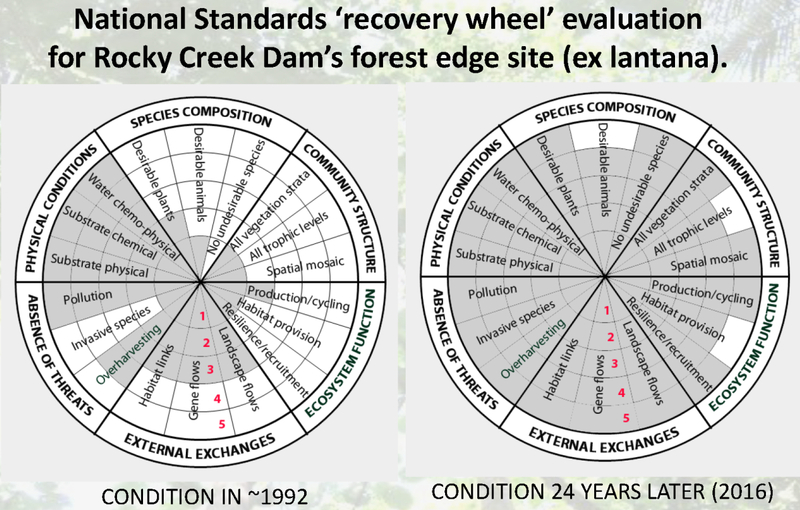 The methodology used for rainforest restoration by Rous Water has evolved over time through an ‘adaptive management’ process at Rocky Creek Dam. 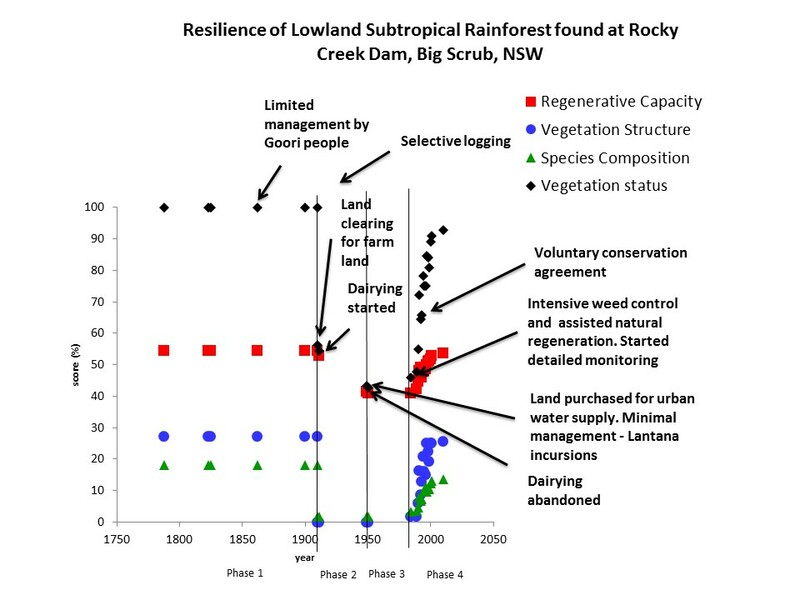 This adaptive management approach has demonstrated that effective large scale sub-tropical regeneration at Rocky Creek Dam is achieved through complete removal of competing plants. The technique has become known as the Woodford Method and is now being applied at other Rous Water restoration sites. The Rous Water Rainforest Reserve at Rocky Creek Dam is set in the northern headwaters of the Richmond River catchment, on the southern rim of the Tweed shield volcano. Basalt flows from the volcano have produced nutrient rich Red Ferrosol that supported diverse sub-tropical rainforest ecosystems across the region, until the rainforest was largely cleared for agriculture in the late 19th century. The Rocky Creek Dam site is adjacent to the Big Scrub Flora Reserve, the largest remaining remnant subtropical rainforest in the region. This reserve acts as a reference site for the restoration project (Fig 1). Clearing of land in the vicinity of Rocky Creek Dam by early settlers commenced in the 1890s, with the cleared lands used for the establishment of dairy farms and a sawmill. In 1949, following acquisition of the site by Rous County Council (now Rous Water) for the construction of a water supply dam, this former farmland had reverted to weedy regrowth characterised by a mosaic of native/exotic grass, Lantana (Lantana camara) and Camphor Laurel (Cinnamomum camphora) which supressed any expansion or recovery of scattered rainforest remnants. Transformation of the site commenced in 1983 when Rous Water became actively engaged in ecosystem recovery by systematically removing weeds that suppressed rainforest regeneration, a practice that continues today. Rainforest restoration methods. 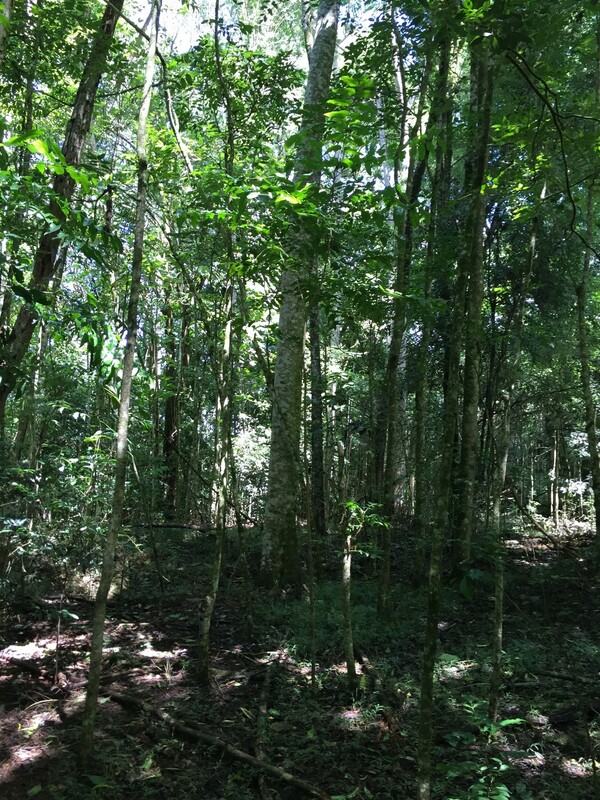 The practices and management tools used in rainforest restoration at the site have been previously described by Woodford (2000) and Sanger et al. (2008). 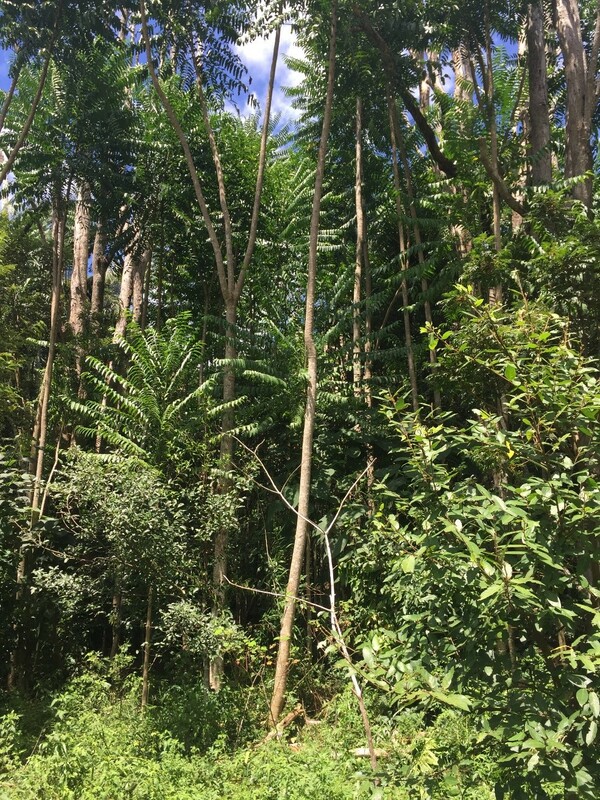 The work method typically involves the systematic poisoning and slashing of weeds to promote recruitment of rainforest plants from the soil seed bank and then to facilitate the growth of suppressed rainforest plants, providing a structural framework for further seed dispersal by wind and, particularly, flying frugivores and thus further colonisation by later phase rainforest trees. Since 1983, an area of approximately 70 ha has been progressively treated in 1-2 ha blocks using this methodology (refer Fig 1), with progressively diminishing amounts of follow-up treatment needing to be conducted in the treated areas over subsequent years to secure successional progression of the rainforest species. Use of this method means that, due to recruitment from the seed bank and the use of stags (from dead camphor laurel) as perches for seed dispersing birds, very limited planting has been required on the site. This has preserved the genetic integrity of the Big Scrub in this location. Results. 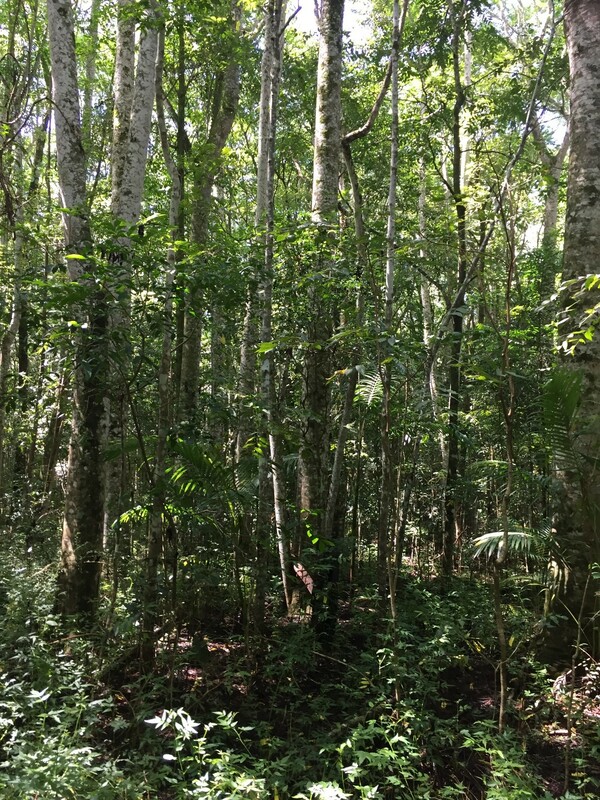 A total of approximately 70 hectares of weed dominated regrowth has been treated at the Rous Water Rainforest Reserve since commencement in 1983 (Figure 1). 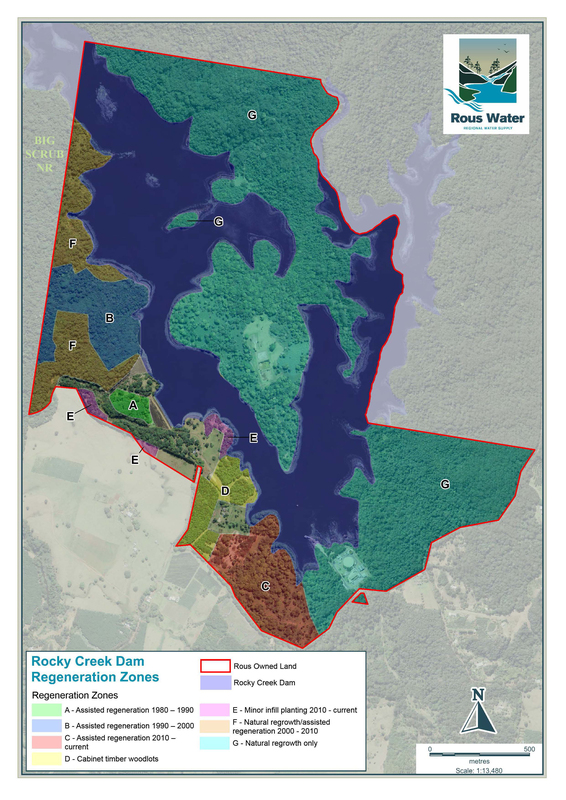 This is approximately 35 ha since the report previously published in 2000 and represents approximately 30 % of the Rous Water property at Rocky Creek Dam. Figure 2. Typical regeneration of rainforest species 1 year after Lantana removal at the Rous Water Rainforest Reserve, Rocky Creek Dam (foreground). The structure of the older treated regrowth areas sites appears to be converging on rainforest conditions, as noted by Kanowski & Catterall (2007). 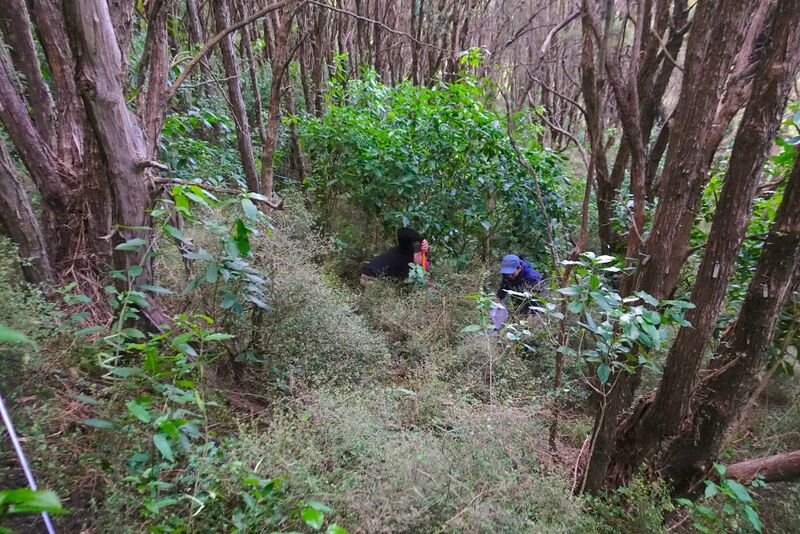 Thackway & Specht (2015) depict how 25 ha of systematically treated compartments that were covered almost entirely with lantana are progressing back towards the original Lowland Subtropical Rainforest’s composition, structure and ecological function (Fig 7). Overall the vegetation status in this area was assessed at between 85% and 90% of its pre-clearing status. Figure 7. Assessment of change in indicators of vegetation condition in a 25 ha area. 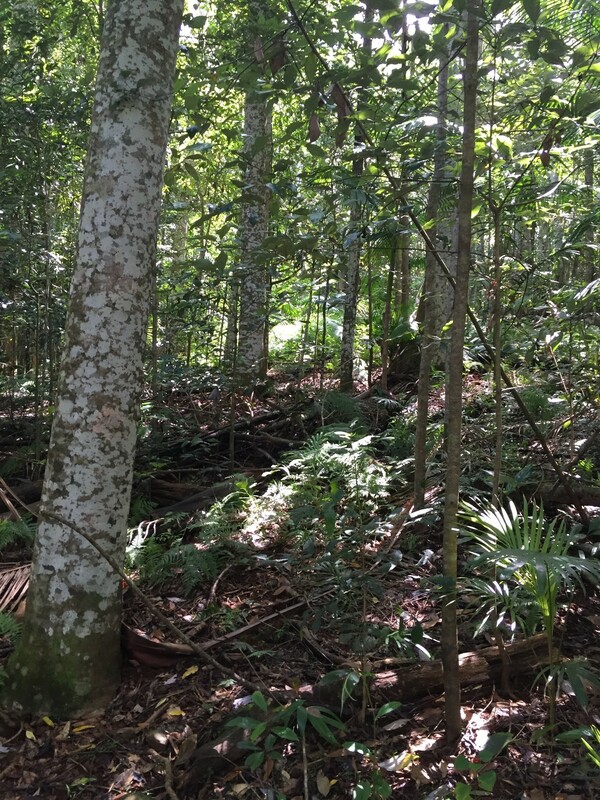 This depicts the degree of recoveery of Lowland Subtropical Rainforest found at Rocky Creek Dam, Big Scrub, NSW against a pre-clearing reference. (Graph reproduced with permission. The method used to generate the graph is described in Thackway, R. and Specht, A., (2015). Synthesising the effects of land use on natural and managed landscapes. Science of the Total Environment. 526:136–152 doi:10.1016/j.scitotenv.2015.04.070. ) Condition indices for transition Phase 4 were derived from prior reports including Sanger et al. 2008 and Woodford 2000. 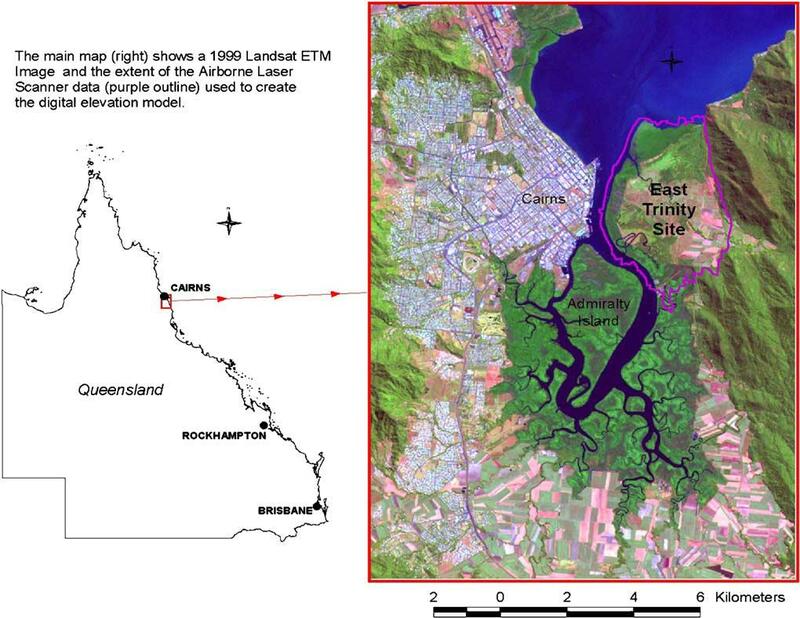 Metadata can be viewed at http://portal.tern.org.au/big-scrub-rocky-queensland-brisbane/16908 . Lessons learned. Using this method of harnessing the natural resilience processes of the rainforest, we have been able to progress the recovery of an important water catchment area, restoring very high biodiversity conservation values in a landscape where rainforest was, and remains, in serious decline., The ability of the high resilience sites at Rocky Creek Dam to respond to the Woodford Method is clearly demonstrated, but there is ample evidence that application of this and similar resilience-based rainforest restoration methods can harnessed resilience at other sites in the Big Scrub that are at greater distances from remnants. Current work and future directions. Work continues at the site and management is supportive of-site evaluation to assess the extent to which the treated areas are undergoing successional development using a range of available assessment tools. 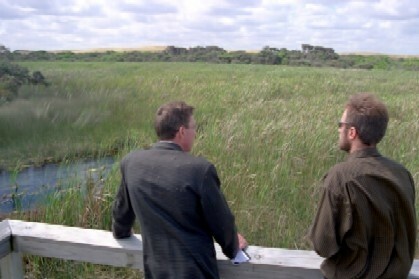 To assist future planning, and in order to address the issue of how to best estimate and plan for restoration works and associated costs, Rous Water has adapted the methodology developed on the Tweed-Byron Bush Futures Project, where each restoration site/area was assigned a Management Intensity Class (MIC) based on a generalised assessment of site condition, weed composition and cover and other management requirements. (Fig 8) The MIC describes the frequency of restoration work required to restore the site to a minimal maintenance level and how many years this would take to achieve. The MIC aims to describe the extent of management intervention necessary to restore the site to a minimal maintenance level. For this analysis this equates to the establishment of a self sustaining sub-tropical rainforest buffer zone. Each management intensity class is associated with a particular restoration trajectory/cost per hectare, based on visitation frequency by a standard 3 person team and expressed in terms of number of visits required to control / manage weeds. 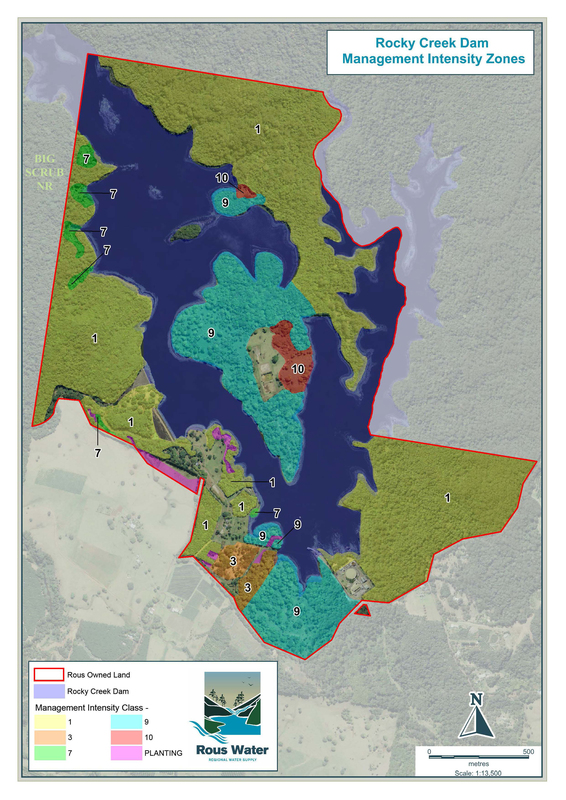 Appendix 1 below shows details of the MIC classification, showing for each class, relevant site criteria, and the estimated level of bush regeneration resources required to bring each class to a low maintenance level.